Look, folks, tablet makers are going to keep trying to seduce you. Armed with numbers that you don't necessarily care about—like these stats about the rise in mobile gaming--they're going to dangle assorted games, controllers and accessories that try to convince you that playing on a phone or tablet can be as fulfilling as doing on it on a PC or a console. The Wikipad—announced earlier this year—is another in a long line of these offerings. Based on my hands-on yesterday, it might be the best. When I first saw the Wikipad, I thought, "Man, that must be heavy." But the actual unit is surprisingly light. The tablet's shell felt like it was mostly plastic. And the controller doesn't add much in terms of ounces, either. Both felt manageable in a standard, two-handed grip. The bumper buttons on top of the triggers felt a little small and tough to locate, but the triggers themselves felt springy and responsive. I played two different games on the Wikipad: Madfinger's sci-fi shooter Shadowgun and Beach Buggy Blitz, a kart racer from Vector Unit. Beach Buggy Blitz ran smoothly, never chugging despite a fairly crowded screen with multiple elements rendering and animating. And Shadowgun—a showcase game for the Unity engine that gets touted a console quality experience—performed well too in the time I spent playing it on the Wikipad. Comparing how Shadowgun looked on the Wikipad against my iPad 2, it felt like the screen on the Wikipad was brighter than on the Apple tablet. Visuals looked about evenly matched despite the difference in brightness. But it was in the control department where Wikipad clearly differentiated itself. I'd only dabbled with Shadowgun on iPad before after hearing how great it looked. The controls were okay for an iPad game, but still lacked the fidelity I was used to in playing similar games on a console or PC set-up. However on the Wikipad, the experience was more familiar and more welcoming. At first, the analog sensitivity was weirdly tuned but a quick jump into settings let me set it just where I wanted. Otherwise, basic controls were natively mapped to the inputs where where I expected them to be. As for what's inside, there's an Nvidia Tegra 3 processor (1.4Ghz) powering the slab. Units will come in one 16 GB configuration and will have a micro SD expansion slot that lets users add another 32 GBs of storage. And if you want to throw the device's games up onto a bigger screen, the multi-use port will output to HDMI with an adapter. Talking to me today, CEO James Bower said the company started in on the project because they felt that gamers weren't getting good enough tablet hardware options. But, still, why shouldn't people just get another tablet and pair it with any of the Bluetooth controllers that are out there? When I asked Bower that question, he said that this device is balanced for gaming in ways that ad-hoc set-ups aren't. Little touches like the weight of the tablet and controller or the groove on the back that lets you get a good grip on Wikipad are meant to make it more game-friendly. Wikipad is running on the Jellybean 4.1 version of Google's Android mobile OS. It will also sport a nifty custom UI that lets you browse titles in the various storefronts that will be offering games for the device. The interface is like a spinner rack, with swipes taking you to Google Play, PlayStation Mobile or Nvidia TegraZone. Bower said that games will be coming pre-loaded onto the device, but the exact titles have yet to be determined. Bower also said that Wikipad has plans to bind the devices to TVs, including a USB dongle that would let non-internet-capable TVs use the tablet's network connection to browse and stream content off the web. And, because it's an Android device, users will have access to all the productivity and entertainment apps in Google's digital download hub. The Wikipad will be retailing for $499 when it hits shelves on October 31st. You'll only be able to get it at Gamestop. 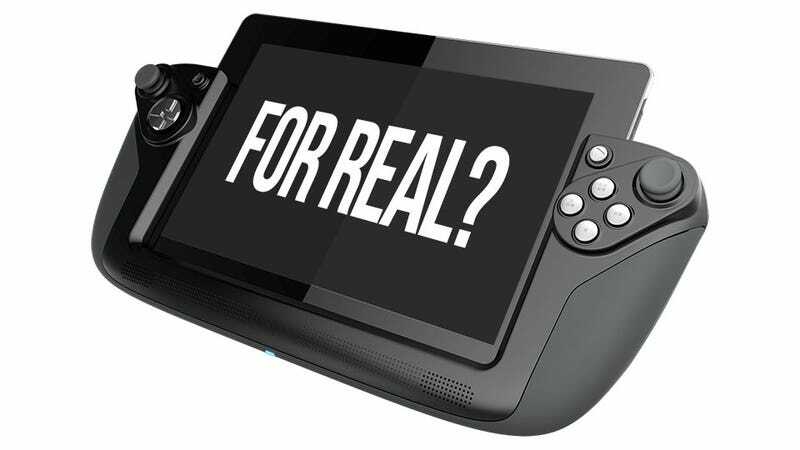 Kotaku will be running a review of the Wikipad as soon as we get the device.